Audi, Hyundai, Kia, Mercedes-Benz and Toyota made up the Super Bowl's automaker ad race this year. See their spots here. 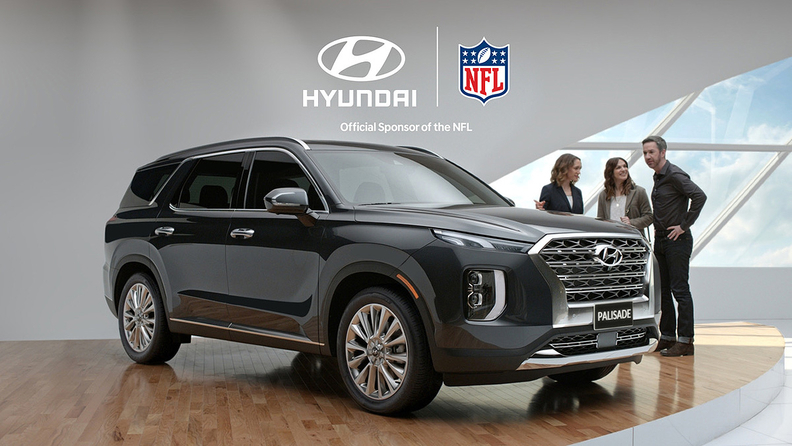 Hyundai went down a more traditional -- and less stressful -- route this year with a 60-second spot touting its Shopper Assurance program. Hyundai, Kia, Audi, Mercedes-Benz and Toyota make up the Super Bowl's auto ad race in a year that's light on metal. For its part, Hyundai didn't conjure up another heartfelt "act of the brand" this year. These "acts," as Hyundai marketing chief Dean Evans calls them, shunned car-based messaging in favor of more impactful themes, such as last year when it sent Hyundai owners through "hope detectors" to highlight its Hyundai Hope on Wheels nonprofit that's focused on finding a cure for pediatric cancer. The brand also left out cars in 2017 when it visually transported three soldiers to Houston's NRG Stadium using 360-degree pods that placed them in a suite with their family members attending the Super Bowl. Part of that spot was shot during the game in a tight balancing act that required rapid-fire editing. The brand went down a more traditional -- and less stressful -- route this time around with a 60-second spot touting its Shopper Assurance program, the foundation of its retail strategy intended to make buying more convenient for consumers. The first-quarter spot stars actor/producer Jason Bateman, and gives the world a look at the upcoming Palisade, the brand's three-row flagship crossover. Hyundai took a list of things people don't like in the spot, including going to car dealerships, jury duty and root canals. Then it merged them into a plot revolving around an elevator in a building "full of life's best and worst experiences," the brand said. A couple gets on the elevator and says they are going car shopping, and then the elevator begins it descent, stopping on floors with designations such as "Root Canal," "Vegan Dinner Party" and "Middle Seat," the place many people try to avoid on airplanes. The other passengers reluctantly step off on their floors before it reaches the bottom level, "Car Shopping." "There's an elevator operator played by Jason Bateman who is sympathetic, but he's also just doing his job," said Barney Goldberg, executive creative director of Innocean USA, Hyundai's agency, in an interview. "Bateman was a perfect guy to play this because he's got that wit and charm. He stays likable, but he can also deliver the bad news and keep it positive." Fiat Chrysler Automobiles, a Super Bowl staple, is sitting out for the first time since 2009 after running five spots during last year's game. Here's a rundown of the other ads. After sitting out last year's Super Bowl, Audi came back this year to put the focus on its electrification efforts. The Audi e-tron GT concept car had a cameo in the 60-second spot, which is slated to run in the second quarter. Audi, advertising in the Super Bowl for the 10th time, expects around 30 percent of its U.S. customers to "go electric" by 2025. Audi's e-Tron crossover can be reserved now and is expected to launch in early 2019, while the e-tron Sportback will follow in 2020. After that, the brand will introduce the sporty e-Tron GT. The brand says it will offer more than 20 fully electric and plug-in-hybrid models before 2025. San Francisco-agency Venables Bell & Partners created the spot. To tout the voice recognition capabilities of the A class, Mercedes-Benz created a wild scenario in which a guy can control everything with a simple voice command. The 60-second spot centers on an A-class owner as he makes his way through his day-to-day life, controlling sports outcomes such as golf putts on TV, ATMs and cartoons, while "transforming a lofty, operatic crescendo into a rap concert" with rapper/actor Ludacris, the brand says. "Say the Word" was created by agency Merkley+Partners. Toyota returned to a sports-driven formula that has powered some of its previous Super Bowl efforts. Instead of featuring a Muhammad Ali voiceover or a Paralympian, Toyota highlighted the inspiring story of Antoinette "Toni" Harris, a 22-year-old free safety at East Los Angeles College. The Detroit native is the first female player to be offered a full scholarship as a non-specialist on defense. Toyota's 60-second commercial features the 2019 RAV4 Hybrid. Toyota also debuted the first spot for the next-Supra, which was unveiled last month during the Detroit auto show. It purchased the 60-second spot for the Supra at the last minute. WeatherTech joined the Super Bowl advertising sweepstakes this year to promote its line of pet supplies under the PetComfort brand.